Chimpanzees (Pan troglodytes) are found in 21 African countries- from the west coast of the continent to as far east as western Uganda, Rwanda, Burundi, and Tanzania. Chimps live in the greatest concentrations in the rain forest areas on the equatorial forest "belt." 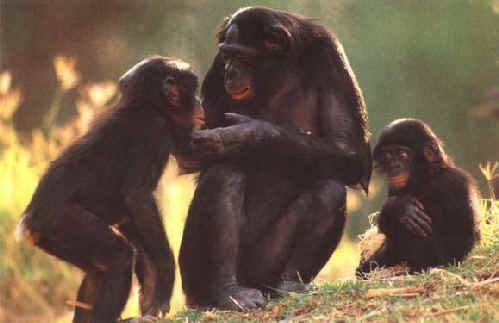 Chimpanzees live in social groups called communities. Chimps communicate with a wide range of calls, postures and gestures. Deforestation and commercial hunting for bushmeat are taking a terrible toll on most chimpanzee populations. SIZE Head and body length 63.5 to 94.0cm. Height when erect 100 to 170cm. WEIGHT Males 34 to 70kg. Females 26 to 50kg. AVERAGE LIFE EXPECTANCY Maximum lifespan in the wild may be 50 years (Nowak, 1991). NORMAL DIET The Chimpanzee eats a wide range of foods, concentrating on fruits, flowers and seeds, but including some young leaves and a variety of small mammals and invertebrates. NORMAL LIFESTYLE Chimpanzees live in communities of between 20 to 106 animals, with an average size of about 35 animals. Foraging and traveling parties are about 2 to 10 animals. Chimpanzees (Pan troglodytes-(Greek meaning for "cave dweller")) are found in 21 African countries- from the west coast of the continent to as far east as western Uganda, Rwanda, Burundi, and Tanzania. In July 1960, Jane Goodall set out to Tanzania's Gombe forest to live among the chimpanzees. Her discovery that chimpanzees made and used tools was groundbreaking, as humans were previously believed to be the only species to do so. Chimpanzees rarely live past the age of 40 in the wild, but have been known to reach the age of more than 60 in captivity. 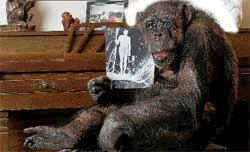 Cheeta, star of Tarzan is still alive as of 2009 at the age of 76, making him the oldest known chimpanzee in the world. 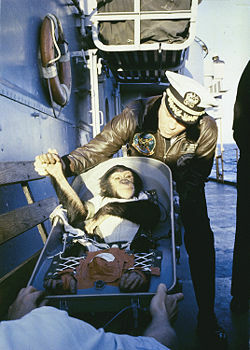 Chimpanzee Ham is greeted by recovery ship Commander after his flight on the Mercury Redstone rocket. On January 31, 1961, Ham, whose name was an acronym for H olloman A ero M ed, became the first chimpanzee in space, aboard the Mercury Redstone rocket on a sub-orbital flight very similar to Alan Shepard's. Ham was brought from the French Camaroons, West Africa, where he was born July 1957, to Holloman Air Force Base in New Mexico in 1959. The original flight plan called for an altitude of 115 miles and speeds ranging up to 4400 mph. However, due to technical problems, the spacecraft carrying Ham reached an altitude of 157 miles and a speed of 5857 mph and landed 422 miles downrange rather than the anticipated 290 miles. Ham performed well during his flight and splashed down in the Atlantic Ocean 60 miles from the recovery ship. He experienced a total of 6.6 minutes of weightlessness during a 16.5-minute flight. A post-flight medical examination found Ham to be slightly fatigued and dehydrated, but in good shape otherwise. 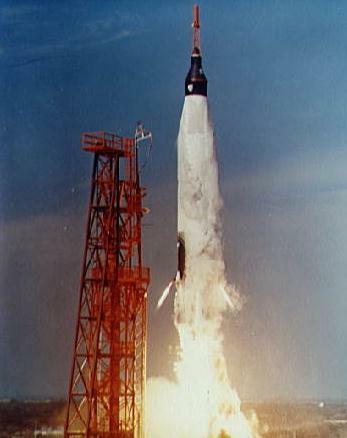 Ham's mission paved the way for the successful launch of America's first human astronaut, Alan B. Shepard, Jr., on May 5, 1961. Upon the completion of a thorough medical examination, Ham was placed on display at the Washington Zoo in 1963 where he lived alone until September 25, 1980. He then was moved to the North Carolina Zoological Park in Asheboro. Upon his death on January 17, 1983, Ham's body was preserved and loaned by the Smithsonian Institution to the International Space Hall of Fame in Alamogordo, New Mexico. 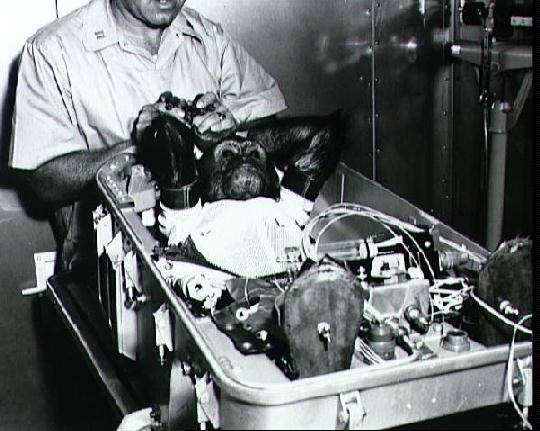 Enos became the first chimp to orbit the earth on November 29, 1961, aboard a Mercury Atlas rocket. Although the mission plan originally called for three orbits, due to a malfunctioning thruster and other technical difficulties, flight controllers were forced to terminate Enos' flight after two orbits. Enos landed in the recovery area and was picked up 75 minutes after splashdown. He was found to be in good overall condition and both he and the Mercury spacecraft performed well. His mission concluded the testing for a human orbital flight, achieved by John Glenn on February 20, 1962. Enos died at Holloman Air Force Base of a non-space related case of dysentery 11 months after his flight. As of November 2007, there were 1,300 chimpanzees housed in 10 U.S. laboratories (out of 3,000 great apes living in captivity there), either wild-caught, or acquired from circuses, animal trainers, or zoos. Most of the labs either conduct or make the chimps available for invasive research, defined as "inoculation with an infectious agent, surgery or biopsy conducted for the sake of research and not for the sake of the chimpanzee, and/or drug testing." Two federally funded laboratories use chimps: Yerkes National Primate Research Laboratory at Emory University in Atlanta, Georgia, and the Southwest National Primate Center in San Antonio, Texas. 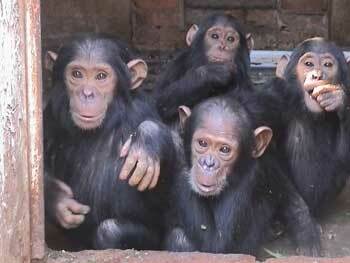 Five hundred chimps have been retired from laboratory use in the U.S. and live in sanctuaries in the U.S. or Canada. In 1960 there were an estimated population of 1 million chimpanzees- today there is an estimated population of about 100,000. To learn more about Bonobos, Chimpanzees, Orangutans and Gorillas visit and join the following organizations by clicking on their logo.